Audi has announced that it will debut a new performance e-bike prototype at next week’s Wörthersee Tour car show in the picturesque village of Reifnitz, Austria. 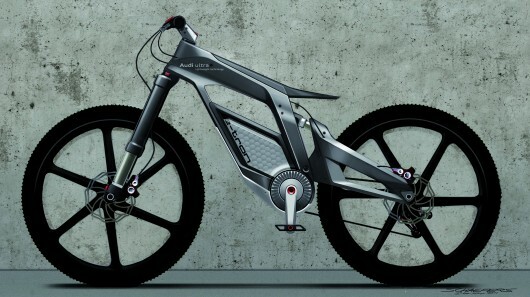 Described as a high-end pedelec for sport, fun and tricks, the Audi e-bike Wörthersee features a futuristic carbon fiber frame that houses an onboard computer and a Li-ion battery pack, and carbon-fiber-reinforced plastic (CFRP) wheels – both designed to keep the weight down. The prototype offers five travel modes, ranging from pedal-power to electric-only, and inclusive of two “Wheelie” modes where the power is automatically controlled to assist the rider while the front wheel grabs some air. The new e-bike prototype will share Audi’s exhibition stand at the Lake Wörthersee car show with 16 current production models, including the new A3, and three new takes on the Q3 compact – the Audi Q3 red track, the Audi Q3 jinlong yufeng – or “Golden Dragon in the Wind” – and the Audi RS Q3 concept. The auto manufacturer says that its new sport bike concept does not fit into any of the usual categories. Audi’s designers are responsible for every component of the e-bike, which features a lightweight carbon-fiber frame that tips the scales at a featherweight 3.53 pounds (1,600 g) reinforced only at load points, 26-inch CFRP rims with large-area blade-pattern spokes that weigh just 1.32 pounds (600 g) each and a CFRP swing arm for the rear wheel. All of which helps towards a total bike weight of 46.3 pounds (21 kg) including the swappable in-frame 48V/530Wh Li-ion battery pack. Charge time is reported to be 2.5 hours from a 230V mains supply. The permanent magnet synchronous motor has a peak output of 2.3 kW, delivers a maximum torque of 250 Nm to the rear wheel, has been placed at the lowest point on the frame and drives the bottom bracket shaft directly. The e-bike’s nine-speed hydraulically actuated gear shift is reported to have a similarly fast sequential action to the R-tronic transmission in an Audi R8. Riders can run through five travel programs including a pedelec mode, where the e-bike is said to achieve a top speed of up to 50 mph (80 km/h) with a range of between 31 and 44 miles (50 – 70 km) per charge. In electric-only mode with a twistgrip controlling the power output, the top speed is 31 mph (50 km/h). Pulling extended wheelies gets some help from the control system, with a “Power Wheelie” mode for less skilled riders that oversees an adjustable wheelie angle, and a “Balanced Wheelie” mode for more experienced riders where the balance is maintained electronically. The latter mode sees the motor either accelerating or slowing down the e-bike as the rider’s weight shifts forward or back. Users can select riding modes, record trick sequences and adjust operation functions using the on-board computer’s touchscreen display positioned within the top bar of the frame, which also shows speed, distance, battery level, energy consumption and slope angle. Operation can also be controlled using a WLAN-linked smartphone (an antenna is integrated into the front brake line), that’s also used to deactivate the immobilizer. Video images captured by the smartphone can be uploaded to the web or sent direct to an online trainer program. Successful completion of tricks is rewarded by increased ranking and challenge difficulty, and online rankings can be viewed on the e-bike’s display via Facebook. Completing the versatile prototype’s specs are hydraulic disk brakes front and rear, upside-down, air-sprung suspension at the front with 5.12 inches (130mm) of travel, LED lighting that’s integrated into the handlebar and the seat and the ability to continuously adjust seat height using a control on the handlebar. Vistors to the Audi, VW, Seat and Skoda Wörthersee Tour car show 2012 – which runs from May 16 to 19 in Reifnitz, on the Wörthersee in Carinthia, Austria – can also look forward to demonstrations of skill from trial biker Julien Dupont and women’s downhill specialist Petra Bernhard.